This blog post by SAIS-CARI's Research Manager Jordan Link is the first in a series that will explore security and military matters as they relate to China/Africa issues, a theme also being explored by our 2019 CARI Fellows. China’s engagement with the African continent has until recently been interpreted primarily through an economic lens. However, China-Africa military ties are also deepening and becoming more complex. China’s first international military base opened in 2017 in Djibouti. The first China-Africa Defense and Security Forum was held in June of 2018 as representatives of 50 different African countries and the African Union met in Beijing to discuss defense and security cooperation efforts. Against this background, what role does Chinese lending play as the China-Africa security relationship evolves? For purposes of this post, we have separated our data into “military,” “domestic security,” and “dual use” borrowing. Between 2003 and 2017, China has loaned USD 2.53 billion to 8 African countries explicitly for military and national defense purposes. An additional USD 1.36 billion was loaned for African policing and law and order purposes, while USD 67 million was lent for dual-use purposes. In sum, African countries signed USD 3.56 billion for military, domestic security, and dual use purposes. Over this same time period, China lent African countries a total of USD 147.77 billion. Therefore, lending for explicit defense and/or domestic security purposes has accounted for just over 2% of all Chinese loans to Africa. The data used in this report is drawn from the loans database curated by the China-Africa Research Initiative at Johns Hopkins University. Only signed, implemented, and completed loans were used for the analysis – all unconfirmed loans were excluded. While the CARI database includes all loan data from 2000, we found no loans specifically for defense and/or domestic security purposes from before 2003. A loan with defense and/or domestic security purposes includes the following types of projects: aircraft procurement, the construction of military facilities, national security telecoms, patrol ships, CCTV systems and military/security wares. We have no loans in our system specifically for the purchase of arms. In keeping with China’s comparative advantage in African construction projects, African governments borrowed over one billion dollars for the construction of defense and/or security facilities such as barracks. 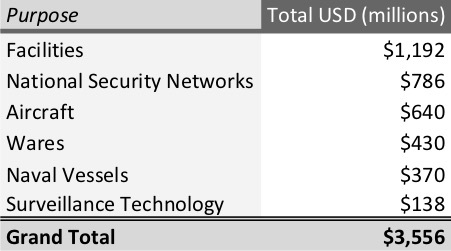 The second largest amount of money went to national security telecoms networks. Third was the procurement of aircrafts. We exclude projects such the construction of government buildings outside of the military, broadband networks, or other telecommunications systems. 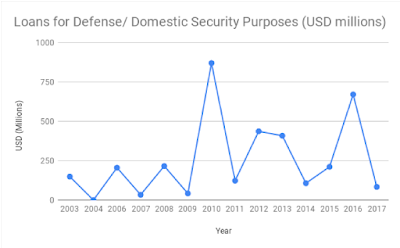 While there are potential defense and security implications for these types of projects, this analysis only includes loans that finance projects signed by the country’s ministry of defense (or equivalent) for explicit defense and/or domestic security purposes. The USD 3.56 billion amount is distributed through 35 different loans. Zambia stands out, with both the largest number of loans (8) and the highest military and/or domestic security-related borrowing (USD 1.42 billion). The Republic of the Congo (ROC) and Ghana each borrowed six times for military and/or domestic security purposes. The ROC borrowed a relatively small total at USD 147 million. Cameroon signed loans totaling USD 414 million, Nigeria borrowed USD 400 million, and Ghana borrowed USD 357 million. The Chinese Eximbank was the top lender, supplying more than 2 billion dollars worth of loans to African countries. This is not surprising as the Chinese Eximbank has lent more money to African countries since 2000 than any other lending source. The second largest source of defense and/or domestic security lending, at USD 440 million, was China National Aero-Technology Import & Export Corporation (CATIC), a Chinese state-owned defense company that imports and exports aviation products and technology. The third highest amount – USD 364 million – was lent by Poly Technologies, a Chinese SOE that imports and exports defense equipment. The ROC, Ghana, Namibia, Tanzania, Zambia, and Zimbabwe all have signed loans for facilities with defense and/or domestic security purposes. For example, nearly all of the loans that fall under this category were for the construction of barracks or housing units for military and security personnel. Zimbabwe has borrowed USD 107 million to build a National Defense College. Zambia borrowed USD 640 million, the highest dollar amount across the Continent. China has provided several loans for the purchase of aircrafts. Aircraft loans present the tricky issue of dual-use technology and equipment. It is difficult to ascertain whether the African countries listed are using these aircraft explicitly for defense and/or domestic security purposes. For example, the MA60 plane is generally used for commercial cargo and passenger flights. However, MA60s have also been used by China for maritime surveillance. These planes can also be used to transport military cargo or personnel. We checked whether the MA60 aircraft financed by Chinese loans were later used by the national airline or by the national air force. Zambia’s total includes a USD 56 million loan for two MA60 airliners and twelve Y-12 cargo planes. According to SAIS-CARI research, both the Chinese Ambassador to Zambia and Zambia’s Secretary of Defense were present as witnesses to the loan signing. This implies that the procured aircrafts were for defense and/or domestic security purposes. In other countries, the national airlines have been flying the MA60 planes. Three other African countries, the ROC, Cameroon, and Zimbabwe have signed loans for MA60 cargo planes that appear to be associated with commercial airline operators. Ghana, Nigeria, Sierra Leone, Senegal, Uganda, and Zambia have signed loans for the creation of national security communication systems. Of the seven loans, six are confirmed to be using ZTE as the contractor to carry out these projects. The one exception was a loan to Uganda, which was put towards acquiring a TETRA Communications System. This system was reported to be used by the police, army, and intelligence agencies in Uganda. Nigeria signed loans worth the most in this category, at nearly USD 400 million. Cameroon and Ghana both signed loans to procure patrol ships. In 2008, Ghana signed a loan to acquire two patrol vessels worth almost USD 40 million. Cameroon signed a loan in 2012 for two patrol vessels worth USD 330 million. In 2003, Mauritius signed a loan for a CCTV Surveillance System and airport X-Ray scanning equipment worth USD two million. Details of the loan did not specify the amount that went towards either the surveillance system or the scanning equipment. In 2016, Côte d’Ivoire signed a USD 53 million loan for the Abidjan Video Surveillance Platform. This platform aimed to reduce crime levels by placing video cameras on dangerous streets and crowded public areas. Cameroon signed a USD 84 million loan in 2017 for an urban video surveillance system. Ghana, Sudan, and Zambia signed loans for the procurement of military and/or domestic security wares. Ghana signed two loans in 2008 for equipment for its own armed forces and peacekeeping operations for a total of USD 160 million. Sudan signed a loan worth USD 106 million in 2003 for unspecified military equipment. In 2016, Zambia signed a USD164 million loan for equipment for its domestic police force, the Department of Immigration, the Drug Enforcement Commission, and prisons. Looking at the total dollar amount lent per year, there were large jumps in both 2010 and 2016. In 2010, Nigeria signed a USD 400 million loan for its police force’s national public communication system. Zambia also signed two loans in 2010: a USD 365.5 million loan for residential housing units for its Air Force and a USD 105 million loan for Z-9 helicopters. Zambia was also a major player in 2016, signing the following loans: a USD 275 million for police and security force housing, a USD 179 million loan for its public security network, and a USD 164 million loan for security equipment. China’s lending to Africa for defense and/or domestic security purposes fits the tenor of its Second Africa Policy paper, an official government white paper published in 2015 that outlines China’s foreign policy strategy in Africa. Moving forward, it is reasonable to expect security ties between China and African countries to grow. The Belt and Road Initiative, marshaled by CCP General Secretary Xi Jinping, is likely to make inroads across the continent due to local infrastructure needs. As such, Chinese economic and strategic interests will continue to coalesce. Chinese lending to African countries since 2003 for explicit defense and/or domestic security purposes has accounted for just over 2% of all Chinese loans to Africa. At present, this total does not seem to be growing. The construction of military facilities such as barracks and housing units is so far the major focus of military-related loans in Africa as China continues to play towards its comparative advantage in infrastructure.